Inside: Do you want to help your child write the most thoughtful kid thank you notes for Christmas or birthday presents? 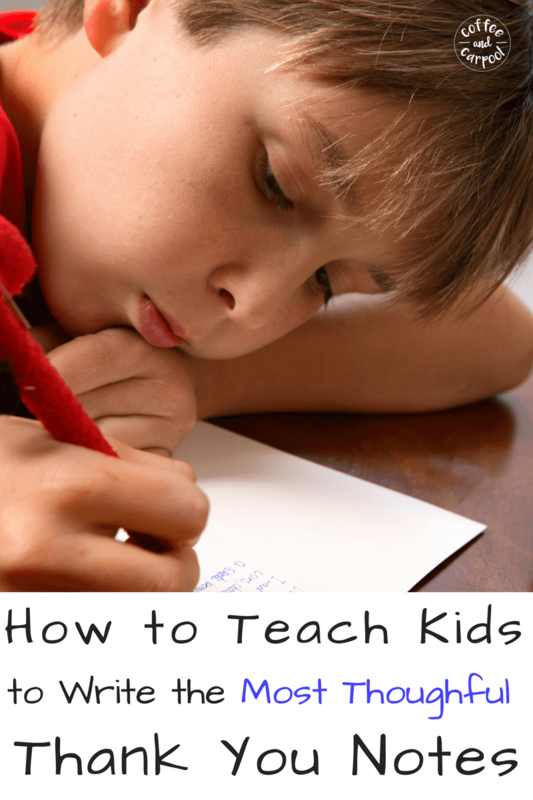 This sweet idea will get your kids writing them with a little less whining. Ahh, c’mon Mama. Do I have to write the thank you notes? Idon’twanttotheyareboring. Whether it’s for their birthday or the winter holidays, my kids detest writing thank you notes and whine their way through their stack. Well, no one loves writing thanking notes. They’re time-consuming. They’re pretty boring. And they’re an old-school thing that my mom and Emily Post used to make me do that my eight-year-old-self swore I wouldn’t continue when I was a grown-up. And yet here I am. Still writing thank you notes. It’s ingrained in me. And I expect my kids to write thank you notes too. 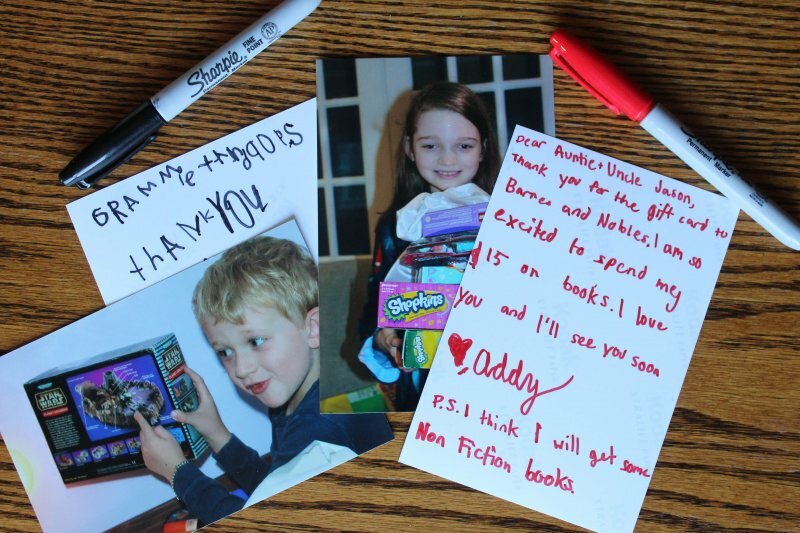 Writing thank you notes teaches my kids a valuable skill that I still believe in. It puts the emphasis on gratitude. It reminds my kids to focus on the person who gave them the gift, rather than the gift itself. And there will come a day when they have to pen a hand-written note in life and I don’t want them scratching their heads. So no matter how old-school it is, we still write thank you notes. We want our family and friends’ generosity to not go unnoticed or unappreciated and we want them to share in the joy our children received from the gifts they bought, wrapped and fought the holiday crowds for. I want them to see the priceless expressions of sheer excitement that a soup cooking class brings a five-year-old. But we don’t send a note card. We’ve started something a little different for our friends and family that everyone seems to love more than old stationary. 1. As kids open their gifts, I take notes in a notebook like this cute Christmas one to help me remember what we all received. On Christmas morning, I take advantage of our Christmas tradition of opening presents slowly to jot down what each of us received and from whom. It’s so much easier to remember it while we open gifts than a week from now. That way when we go to write our thank you notes, there’s one less thing to be frustrated by. 2. I take pictures of my kids opening their gifts, playing with their gifts, or wearing their gifts. If my child got an experience rather than an item, I remember to take pictures of them enjoying their outing. For birthday party gifts, I take photos of my birthday kid and their guests so parents receive a picture of their child, not just my kid opening a gift. 3. Print a photo for each note that needs to be written. My family loves getting these thank you notes because they get a snapshot of the moment they may have missed plus an actual real-life photo, rather than just a digital one. 4. Have your child write their thank you note on the back of the photo using a sharpie. 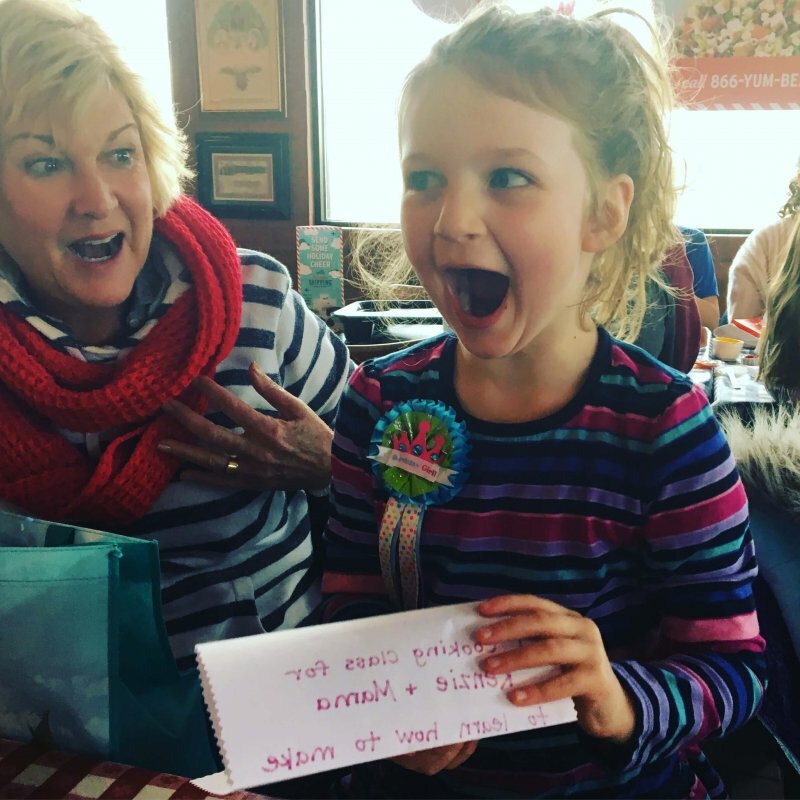 The gift giver gets to see their present being enjoyed and if you’re lucky you can capture the sheer surprise or excitement on your kids’ faces in the pictures. 5. To avoid overwhelming my kids, we tend to write five at a time and then take a break. I let my children choose which thank you notes they want to write first because having a choice in the matter tends to minimize the whining. But even if we’re writing five at a time, my kids try to get away with the bare minimum. Um, no. “Thanks for the gift” isn’t going to cut it. Little effort shows little gratitude. So we have to practice. We have to learn how to write a thank you note. 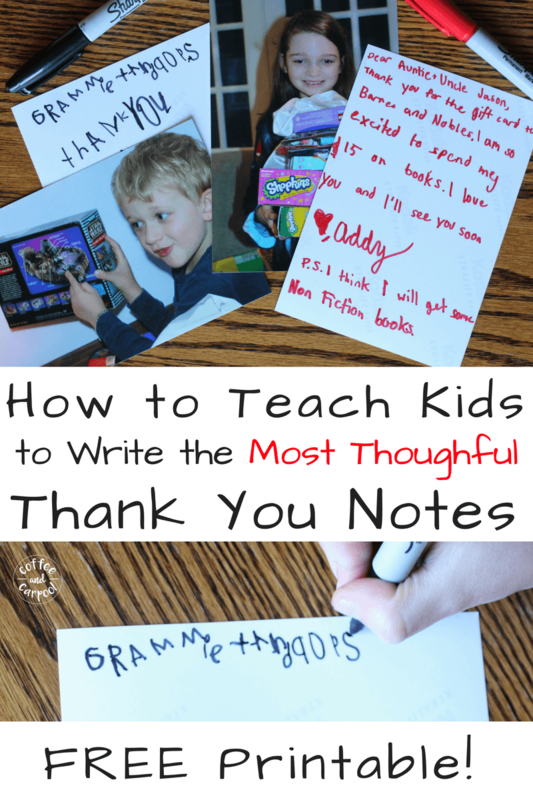 For my younger kids, we talk through the thank you note ahead of time and brainstorm a few things they can write. 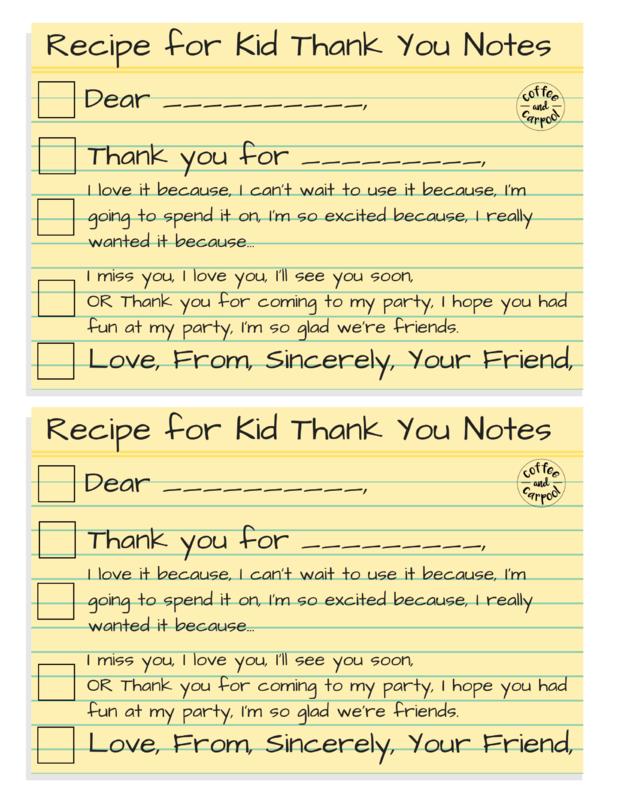 For my older kids, they know the recipe for a good thank you note and can be more independent. Either way, we tend to write our notes at the kitchen table so everyone stays on task and puts in their –ahem– best effort. To help my kids write thank you notes, I teach them this simple format. Get this free printable your kids can have next to them as they write. They simply choose the most appropriate choice from each box to write. Thank you for the …. I miss you. I love you. I’ll see you soon. OR for birthday gifts from friends: I’ll see you tomorrow. Thank you for coming to my party. I hope you had fun at my party. If your child is too young to write thank you notes, there are other options that still allow them to participate. 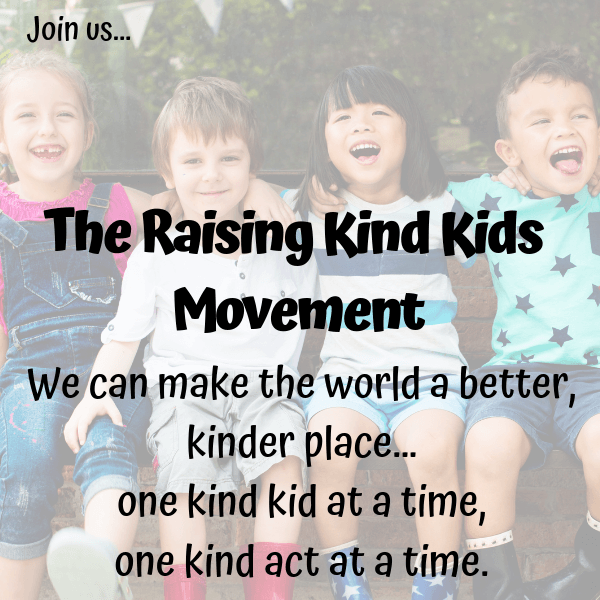 They can scribble their name, write the first letter of their name, write their name, dictate their thank you note for you to write, or copy something you write. The dictated ones are the sweetest because the toddlers and preschoolers tend to ramble and I transcribe it, poor grammar and mispronounced words and all. I don’t want to drag out this experience any longer than is necessary. It needs to be as painless as possible so I don’t have to hear them whining. And they don’t need therapy as adults. So we take a few shortcuts that I don’t think anyone minds. Or even notices. If it was a joint gift, one kid writes the note and everyone signs it. My kids rotate who has to write the group note. If it was identical gifts (ie. they all got gift cards), again one sibling writes the note and everyone signs it. They write the notes, I address the envelopes. That saves headaches for me and the mail carrier. Since they need to write with a sharpie on the back of the photo, they get to choose the color. I have a fun sharpie collection for them to choose from. My kids don’t need to write thank you notes to me, my husband, or to each other… especially for our special tradition gifts that we exchange on Christmas Eve. Those gifts get a free pass. The important thing is not what they write. It’s that they do it. My kids get used to the concept of “get a present, write a thank you note.” Cause and effect. It’s all part of the experience. And contrary to what my eight year old thinks, thank you notes will not kill them. 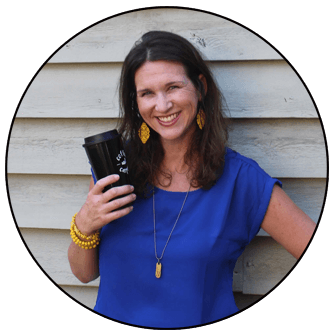 They don’t have to like writing thank you notes. Don’t tell them, but I still don’t like it either. But if my kids want to be able to enjoy the gifts they receive, thank you notes are simply part of it. And because I’m busy and the kids are busy, and none of us are excited to do this particular chore, sometimes it takes us up to two months to get them all written and mailed. So our thank you notes are often not delivered in a timely fashion. But it’s the process that counts. It is the lesson my kids learn. And it reinforces the message to the gift givers in our lives that we appreciate them and their thoughtfulness and their time spent standing in a ridiculously long line to pay for the gift. So, I have to admit that while they’re sweet and thoughtful, our Christmas thank you notes don’t often get into the mail until early February. Somehow, I don’t think Emily Post or my mom will mind though. 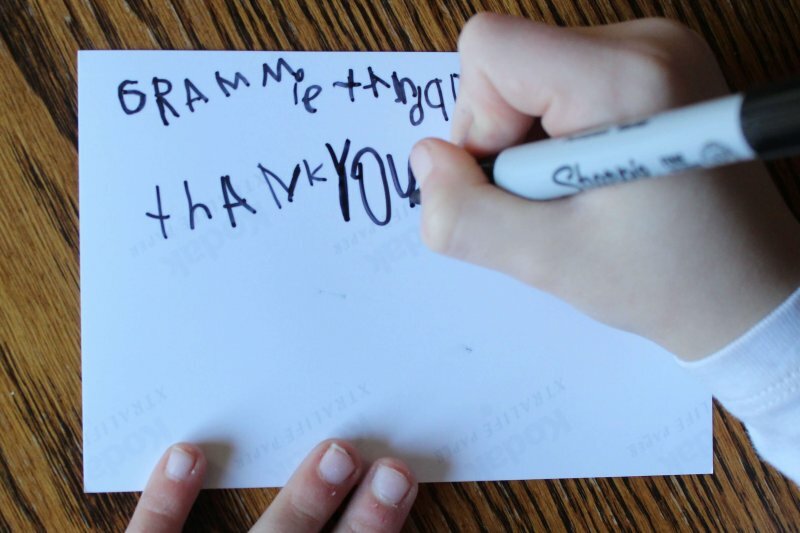 Do you make your kids write thank you notes? What are your tricks for getting them to do it without complaining? We were not able to finish our thank you notes during the last two years! I think with your receipe, we will be able to do them even with fun!!!! So glad! Good luck with them this year! Notes like these don’t seem to be a very common thing here inGermany but I love the idea of putting the focus on the person who gave them the gift, rather than the gift itself. Thanks for sharing, it’s definitely something I want to teach my daughter once she is old enough.